Over the years, researchers have gathered several risk factors for heart disease ranging from not making a lot of money, to smoking, to stress. Now, a new study shows just how the use of Twitter can help dictate what populations are at risk of coronary heart disease: by identifying which users are tweeting about negative emotions like anger, stress, or fatigue. The study, led by Johannes Eichstaedt at the University of Pennsylvania (in collaboration with others) and published in the journal Psychological Science, found that a county’s tweets about negative emotions were associated with a higher risk of heart disease for that community, while tweets that were more positive were associated with a lower risk. In a way, Twitter could become a tool for researchers who are trying to understand the psychological health of a community — something that was difficult to measure in the past. The researchers studied public tweets from 2009-2010, scattered across 1,300 countries. Language considered negative — such as the word “hate” or swear words — were associated with heart disease mortality, while more positive messages involving words like “friends” or “wonderful” were linked to a lower risk of heart disease mortality. 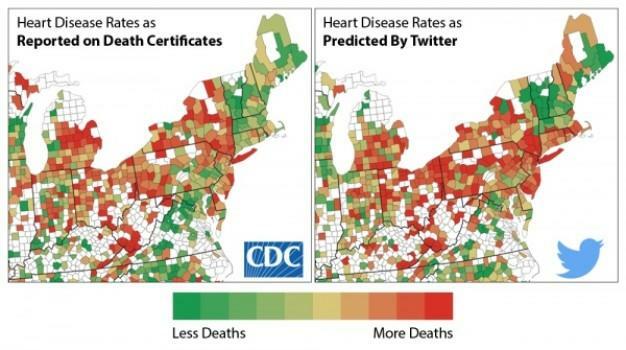 It wasn’t necessarily the people writing negative tweets who were dying of heart disease, however: rather, the tweets were indicative of a higher rate in certain communities. Along with risk factors like high blood pressure, high cholesterol, diabetes, smoking, obesity, and physical inactivity, other heart disease risk factors are psychological — like stress and depression, which can have an impact on a person’s physical health, desire to exercise, and eat well. The trick, then, was to examine how negativity in people’s lives — as well as daily experiences of depression or drinking, for example — manifested itself on Twitter. The World Well-Being Project at UPenn is attempting to use Twitter and other social media outlets to better study psychology across large groups, mostly through the use of online language. One study completed by these researchers, published in 2013, examined Facebook status updates from 75,000 people. These status updates allowed the researchers to make surprisingly accurate estimates about each individual’s gender, age, and even personality. This is one of the reasons why Eichstaedt and his team wanted to harness Twitter’s vast sea of language and daily experiences as a way to better understand psychological undercurrents within communities. Of course, Twitter’s 140 characters has its limitations; but as social media develops and expands, scientists may learn new ways to harness it for psychological and medical research. Source: Eichstaedt J, Schwartz H, Kern M, Park G, Labarthe D, Merchant R. “Psychological Language on Twitter Precits County-Level Heart Disease Mortality.” Psychological Science, 2015.